There's a BIG difference between success and happiness. Happy people are grateful for what they have. Successful people are driven by what they're going to get. Successful people worry about what's NEXT... happy people embrace what's NOW. 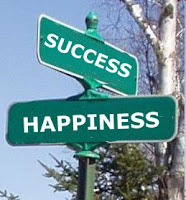 This concept of Success versus Happiness is a tough quandary. Sort of a Catch-22. Because the key emotions and drivers that lead to either success or happiness are opposite and conflicting. Think about it... Successful people are often anxious, dissatisfied, driven, motivated and discontent. However, these are the exact emotions that drive them to be more successful. On the contrary, happy people are usually calm, content, satisfied, grateful and generally relaxed. As a result, they may come across as lacking drive and ambition. Because the key elements are in such opposition, it becomes difficult to be both successful and happy. This is why we see so many people in the world that appear very successful on the outside, but feel very unhappy on the inside. Think celebrities. It's a tough riddle to solve, but it can be done. And the answer may be gratitude. That means really appreciating what you have and taking time to actually enjoy it. As Dale Carnegie said, "Success is getting what you want, but happiness is wanting what you have." How do you spend the majority of your time... enjoying the things you have... or dwelling on the things you DON'T have? That's a strong reminder to start and finish each day by reflecting on the things you're grateful for. I think you'll find that fear and worry and troubles simply cannot exist inside a mind that is filled with gratitude. So to balance success and happiness... here's what I believe... the more you get, the more time you must spend "cultivating gratitude". That means giving thanks, giving back, and actually taking time to reflect on the things you have. It also means taking time to pause and occasionally set your worries, fears and ambitions aside to allow yourself to really live in the moment. The challenge is that all of this stuff requires conscious effort, because it's easy to start taking things for granted. So as you set your goals, dream big and plow forward, but never lose focus on the most important things in life. What are your thoughts? Do you think it's possible to have both success and happiness? What advice do you have for obtaining both? Jessica and Megan... for your debate, are you arguing that success is more important than happiness? That's a tough one, because I firmly believe that happiness is more important than success. Aristotle said, “Happiness is the meaning and the purpose of life, the whole aim and end of human existence." So, if the ultimate goal of life is to spend as much time as possible in a state of happiness, then being happy means you're achieving your goal, and thus you should be happy. However, if you start with success - and make that your ultimate goal - then, like many people in the world, you may very well find yourself feeling unfulfilled. Think of all the celebrities who seem to have everything they want - fame, fortune, lots of money - they've achieved success in the eyes of the public, but inside are they really happy? I'm sure a lot of them are, but we've heard plenty of stories of celebrities turning to drugs, alcohol and other self-destructive behaviors because of the pressure and stress that comes with constantly pursuing success. Here's a great story I once heard from Dr. Wayne Dyer... there was a young alley cat who was very unhappy. One day, a wise old alley cat told the little one to cheer up. He said, "Happiness is in your tail. When I was younger, I spent my whole life chasing my tail, trying to catch happiness. But all I did was spin around in circles. Then, as I grew older and wiser, I realized that if happiness is in my tail, then all I have to do is smile and march forward and then happiness will follow me wherever I go."